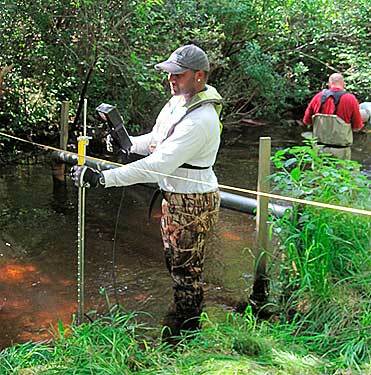 USGS scientist measures stream flow. Photo courtesy of USGS. Sufficient funding to maintain continuous river and stream flow monitoring in Rhode Island is increasingly a challenge. Monitoring has historically been supported by annual joint funding agreements between the US Geological Survey (USGS), the RI Department of Environmental Management (RIDEM), and the RI Water Resources Board (WRB). While RIDEM and the WRB have managed to allocate funding to sustain the network over the last few years, it remains vulnerable to disruption from potential cuts in federal support as well as limitations in state funding. Over time, costs of maintaining the river and streamflow monitoring network in Rhode Island will likely rise—particularly given the increased precipitation and storminess associated with climate change as well as periods of drought—and there will be a need to expand monitoring to support priority needs related to water supply, water quality, and floodplain management. In addition to needing full federal funding of additional National Streamflow Information Program gages, developing a reliable source of state funding to sustain the network should be pursued given the widespread reliance on these data by entities at the federal, state, and local levels.